Ravda is a small coastal village and seaside resort in southeastern Bulgaria, located 3km south from Nessebar and 5 km from Sunny Beach and 30 km from Bourgas airport. The quiet resort is famous for its nice beach and fine sand, which attract mostly families with children. The position on the Bulgarian Black Sea Coast provides for the nice weather, quietness and calmness of a country village and the proximity to the attractive resorts Nessebar(world heritage site) and Sunny Beach offers plenty of attractions and entertainment possibilities. It is a popular holiday destination not only for families with children but also young people and students. Ravda beach spreads out on an area of 57 000 sq m and is divided in two by Cape Ravda. 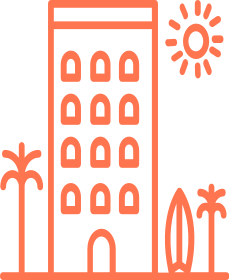 The resort provides different accommodation opportunities: there are hotels of different categories, apartments, family hotels, rental rooms, etc. Ravda also offer good water sports facilities such as diving, jet skiing, yachting, windsurfing, etc. There are regular bus lines to the other resorts in the area — every 30 minutes to Burgas and every 20 minutes to Sunny Beach and Nessebar.